On vacation from Japan in New York City in 1995, pianist Eri Yamamoto saw a performance by the Tommy Flanagan trio that changed the course of her life. She decided to trade the solitude of the classical music stage and the loneliness of the long distance recitalist for the camaraderie and interaction she hoped to find on the jazz bandstand. Technically proficient, but with a gospel-ish touch and a swinging attack, Duologue is Yamamoto's debut as a leader in a setting outside of the typical piano trio (after four albums with drummer Ikuo Takeuchi and different bass players and fewer and fewer standards). For this CD, Yamamoto chose to play two compositions with each of four partners: saxophonist Daniel Carter, drummers Hamid Drake and Federico Ughi and bassist William Parker. 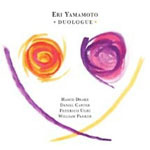 Each player brings his particular voice to the performances and Yamamoto composed to each of her collaborator's strengths, so the disc feels a bit like a sampler, a distillation of four different albums. From Carter, she coaxes his most lyrical playing, his alto impossibly wistful and dreamy on "Conversations." Drake plays frame drum on both of his selections and "Midtown Blues" features Yamamoto's jaunty, brawny physicality and strong left hand making up for the lack of an anchoring double bass. That anchor returns courtesy of William Parker and "Muse" radiates with warmth, regret, beauty and hope, while the opening "Thank You," with Ughi at the kit, is dramatically propulsive. Duologue is characterized by lovely songcraft and guileless performances and is a perfect showcase for Yamamoto's dense, impressionistic cascades and dazzling romantic swoon. The inside cover photo of the five musicians, lined up arm in arm, proves they were all together at one time in one spot. What a quintet that would be.